SALT LAKE CITY – The Church of Jesus Christ of Latter-day Saints made an unprecedented announcement in a small press conference prior to the opening session of General Conference on Saturday. The brief meeting took place with a small group of local, and national reporters as well as Stake Young Single Adult representatives in what will go down as a historic day in LDS church history. The YSA reps promptly took to their personal electronic devices to start spreading the word through their social media accounts. 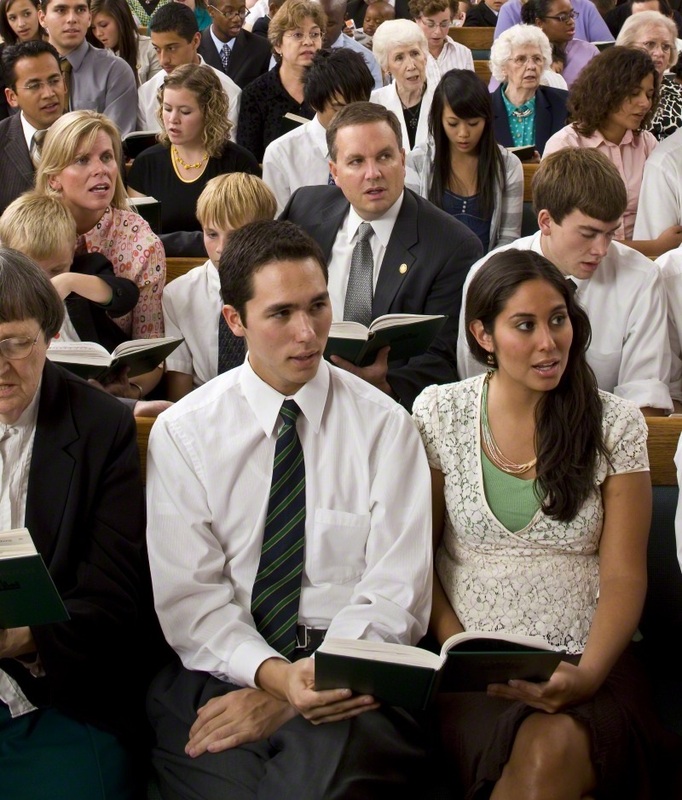 Two LDS singles sit anxiously on the front row in a family ward meeting. The popular statement by Brigham Young was not part of official Church doctrine, but had made the rounds through Mormon myth websites and even into several YSA ward Sunday School lessons. 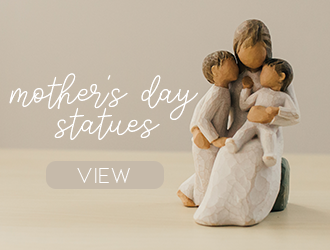 The phrase was used by both grandmothers and mothers alike in an effort to persuade their male offspring to get serious about finding their eternal companions. The church will begin to transition hundreds of thousands of LDS singles around the world into corresponding family wards and branches. In areas with heavy single member populations like Provo, Utah, and Southern California, families with three children or more will be assigned to attend singles “clusters” in an effort to excite the unmarried Latter-day Saints to start their own families, but forever ending quiet sacrament meetings. 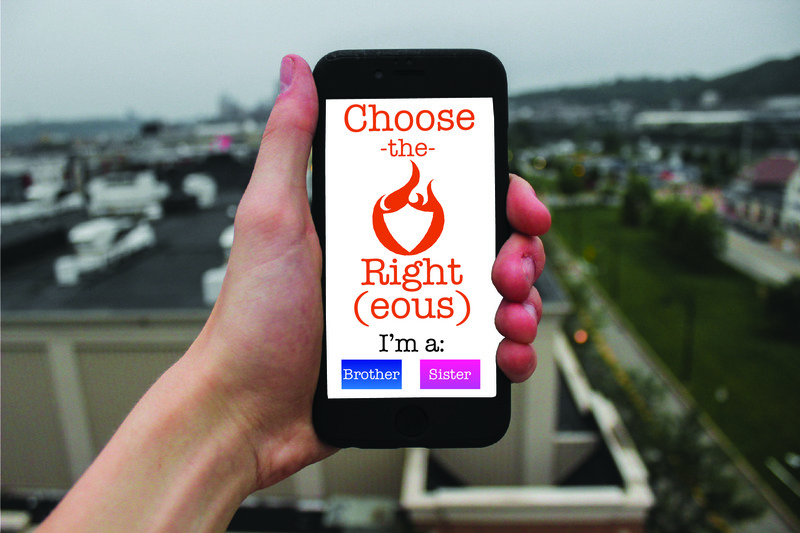 The new Choose The Right(eous) app is available on iPhone, Android, and Blackberry (mid-singles) devices. In areas where awkward or uncomfortable dating experiences have taken place, the Church will allow both males and females to request an emergency transfer, in which case they will be relocated to a neighboring ward or branch unit. Transfers must be approved by both the Bishop and the ward matchmaker after a council with both parties. In addition, the Church is doing away with the term “mid-singles” in an effort to provide more intermingling, regardless of age. “We are confident this change will better accommodate the busy lives of LDS singles around the world and help them feel less pressure to tie the knot,” Brother Young continued to the small awestruck group of media and singles. The transition process will start in the United States immediately and are expected to roll out to the rest of world in the coming months. 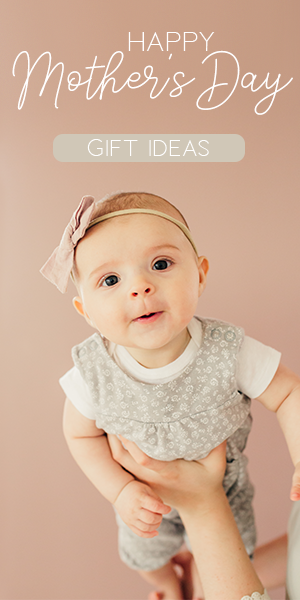 Individuals with questions or concerns are encouraged to take them to their Family Home Evening Moms and Dads. Brandon the husband to an incredibly talented soccer mom, father to a miniature goldendoodle, and the cutest twins you have ever seen. Brandon has served in various church capacities including full-time missionary in Madrid, Spain, youth instructor, Young Men's Presidency, Executive Secretary, temple worker, and Elders Quorum Presidency. Brandon owns LDSBookstore.com which has been featured as one of the fastest growing companies in Utah.